Sanford has built a strong reputation with artists who depend on quality and consistency in color. These permanent markers feature two different style nibs that give the artist flexibility– one end has a broad (wedge) nib and the other a fine nib. Alcohol-based permanent ink is low-odor and will not bleed. Available in an extensive range of colors including primary colors, mid-tones, grays and metallics. Due to particular formulation, metallic colors require single nibs; available in fine and broad. New Special "Easel" Carrying Case! 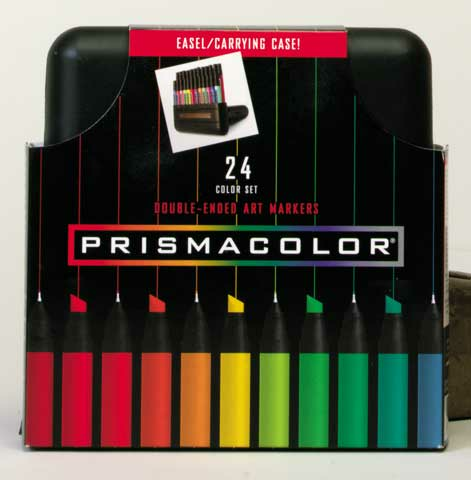 Prismacolor Color Markers also come in 6, 48, 72, 120 and 144 stick sets. Makes a great Gift too! Professional Art Markers 24 piece set W/Case. All markers carry the AP NON-TOXIC seal.